Most governmental organisations require documents in a foreign language to be translated by a professional before they are turned in. In the same way, legal documents need to be translated following very specific guidelines. Immigration New Zealand, for example, explicitly states that all translations “must be certified as a correct translation made by a person familiar with both languages and competent in translation work”, as well as “bear the stamp or signature of the translator”. 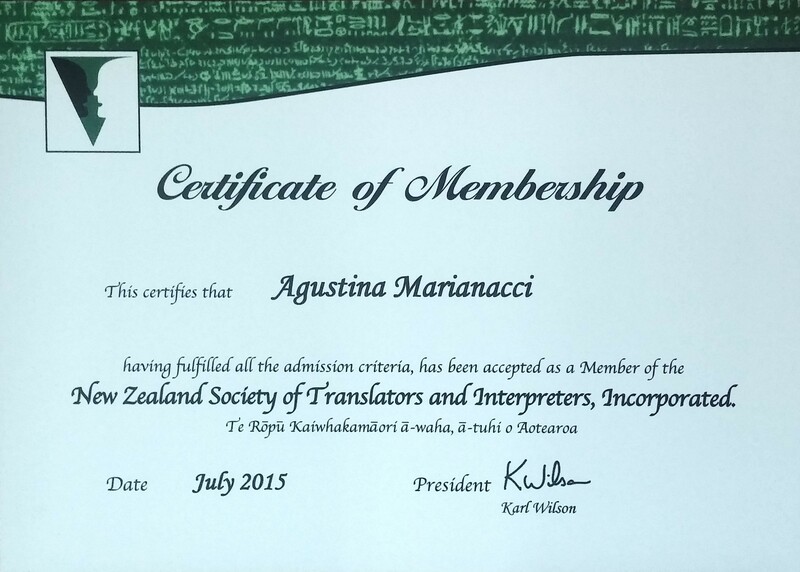 As a full member of the New Zealand Society of Translators and Interpreters, a national representative body, I can offer certified translations from and into English or Spanish. These translations are sealed and can be accompanied by a Translator’s Certificate, in which I declare to be a professional translator, a member of NZSTI and fluent in the source and target languages. If you need a certified translation, contact me with the details to obtain a quote free of charge.